Record breaking Gordon Smith Relays! A record-breaking 150 teams turned out in force to take on the annual Gordon Smith Relays in Wallsend on Wednesday. Clubs from across the North East descended on Segedunum, with each member of the teams of three running a two-mile leg each. This year, the new course included the gruelling Swan Hunters bank but it did not deter the awesome pack who did the former Wallsend Harriers Chairman, Gordon Smith, proud. Tyne Bridge Harriers entered an impressive 26 teams and swept the board on the night, coming first and third in the Men’s Team category (32:48 and 34:00 respectively). Alison Dargie and Terry Scott of Tyne Bridge were the fastest male and female vets (12:19 and 11:11 respectively). Kurt Heron and James Dunce were also the club’s 1st and 2nd fastest senior men (10:45 and 10:52 respectively). Second men’s team was Gateshead (33:50). The top three ladies teams were Jarrow & Hebburn 00:39:19, Alnwick 00:40:31 and Gosforth 00:40:42. And the fastest lady was Paula Foley from Gateshead. 26 youngsters took part in the 1k Fun Run, with some fantastic times from our Green and Gold Juniors. First across the finish in just 5:22 was Mat Summers, with Ethan Bond second in 5:49. Marissa O’Rourke was hot on his heels as first girl in an impressive 5:51, with Ellen Williams and Briony Livermore neck and neck fourth in 5:54. Full results here. Thanks to all those who turned out to run, not to mention the supporters, organisers, marshals and the very patient David Daniels for taking on the mammoth task of sorting the results! Full list here. It seemed very fitting as I turned on the car radio on my way home that Radio 2 was playing ‘Local Hero’. I felt very proud to be part of a special community of North East runners who came together to remember their own local hero. I’m sure Gordon was smiling down on us all. Annual subs are due to be paid by 31 May 2015 for all members. The cost is £45 for adults and £20 for juniors. This includes the cost of your England Athletics registration. Please note that the club does not automatically renew your England Athletics registration. So, if you don’t pay your subs, you won’t get discounted entry for races, be eligible for team prizes or take part in T&F and XC. Once you have paid your subs, we will renew your registration. Subs can be paid by cash, cheque or bank transfer. See members section for more details. Registration, presentation and refreshments at Segedunum, Wallsend, this year (just a couple of hundred yards from the start). Braving the elements to track and field victory! Team Wallsend/Blyth only just went and won the first track and field event of the season by nearly 80 points! Braving hideous weather a full team turned out at Churchill Playing Fields, Whitley Bay, to put in an absolutely amazing effort. A big shout to the five women who battled out all events possible – Michelle, Lyndsey , Jitka and Lynchy. We couldn’t have done it without you girls! Well done. It just shows how many points you can gain by entering people in all the events. We are so proud of all our wonderful athletes and for the superb officials and support. Our next event is in Middlesbrough on Saturday 6th June, let’s get it in the diary and have another great turn out…go go go team green, white and gold! The 2015 track and field league kicked off on Sunday 3rd of May in true British style…i.e it was cold, grey and everything was rather wet. Nontheless the beginnings of the Blyth/Wallsend contingent were there nice and early and, with only a little moaning and wondering when the event would be cancelled, we got the tent set up. At this point I was happy to ‘borrow’ a cup of Ralph’s coffee, sit in the tent and wait for the fun to begin. As ever, the morning was slow with only some brave hammer throwers competing. We were well represented in these events though, with Paul Corrigan and Ralph throwing for the men, and Sharon Richardson and Becki Newman throwing for the women. Becki is clearly a big fan of the rain as she had also filled the B slot in the Long Jump, with Erin Scott (just about) turning up in time to be our A jumper. It’s great to see athletes like Becki trying so many new events. Mercifully, the rain began to ease up a little, just in time for some of the day’s star performances. One being a winning 400m hurdles race from Lauren Barrett, in a PB of 76.9 seconds, she won comfortably and looked strong the whole way around. Showing off his Long Jump prowess at the same time was youngster Peter Skirrow who launched himself in to a big personal best at 5.60 metres. I jumped far less impressively as the B athlete in that event, but scraped a few precious points nontheless. Next up on the track was Blyth’s track and field allstar, Daniel N’jai who showed off how much he has improved over winter by breaking 60 seconds for the 400m hurdles for the first time. Not only is this a PB, but also a club record, winning his race by a clear margin. In the B race for our combined team was Michael Day who finished 3rd, claiming valuable points from a tough event. One of the the events that is always hotly contested, the 800m, was the next to go off, and leading the Wallsend/Blyth team was Leanne Herron in the women’s A race, showing off her tactical mind by running a reserved first lap, before storming the second lap and taking a close 3rd place. In the B race, it was Becki’s turn to show what she could do, performing well to also take 3rd. Then it was the men’s turn to hold their own, and it was team leader Paddy Dinsmore who ran in a gruelling 800m, hanging on to 5th with a great time of 2:13.8. This was followed up by the younger, but no less wise, Joseph Dungworth who led the race for a lap and half and came through in second place. At the same time, Daniel Njai and Paul Corrigan were teaming up to take 7 points each from a closely contested Discus event. Peter was back in action in the high jump next, stealing the men’s A competition with a big PB of 1.68 metres, showing just how in form he is, whilst Wallsend’s Denver Stretetsky cleared 1.40, which was enough to take maximum points in the B field. Meanwhile on the track, Ella Wood and Michelle Heron took third and second in the women’s 100m A and B. Blyth veteran Dave Swalwell stretched his legs in the 100m with a great season opener of 12.3 seconds into the wind, coming 4th in his race. 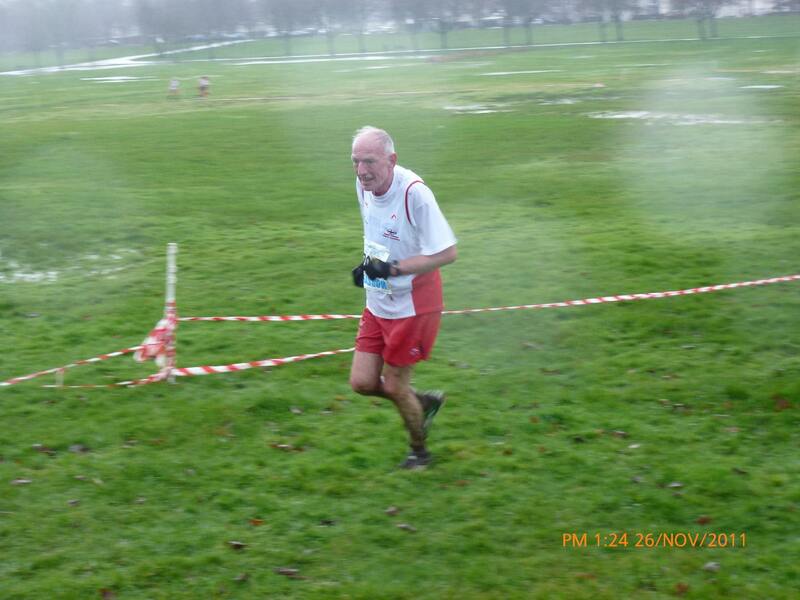 I ran in the B race, finishing 5th in a time that I was less than impressed with. But it’s points that count, and points is certainly what Michelle Heron and Anne Craddock came away with, performing well against tough competition in the shot putt. Jitka Richards and Becki Newman of Wallsend combined to both take second place in the A and B fields of the triple jump. At this point, the team were in good standings, having left few events unfilled, but needed an inspiring performance, a true green-vested hero, to drive us on for the rest of the afternoon. Sadly, Jake Jansen wasn’t available, so Jon French rallied the troops himself with a strong steeplchase win, in a time that isn’t too far off the Blyth record. The Robin to his Batman was Sean Macintyre, who took first in the B event, in what is one of the most challenging track events around. Jon’s time puts him first in Britain for V35 steeplechase, which is a wonderful achievement. This morale boost led to a string of victories including Daniel and myself winning the A and B over 110m hurdles (a truly terrifying experience to the uninitiated), Lauren Barrett and Lyndsey Thompson taking second and first in the A and B women’s 400m, and Paul and Dave taking second and first in the A and B men’s shot. This was closely followed by the men’s 400m in which young guns Jake Masterman and Denver ran flying times against tough opposition. Next in the field was Alice Dungworth taking on the high jump for the first time and clearing 1.10m to take some points from the A field. Blyth were leading comfortably at this point, and we just needed to hold onto our momentum. With Sarah Lynch, Leanne Herron, Simon Lyon and Jon all scoring big points in the 1500m, Peter and Sean stealing a few points from a tough javelin field, and Jake and Steve Aird coming away from the triple jump having beaten a few of the opposition, it seemed unlikely that we could be caught. Ella was back in action in the women’s 200m, coming 4th in the A race, followed by Jitka who took second in the B. Obviously having never recovered the morning drenching, I could only manage 5th in the men’s 200m A, but Dave put in another strong run to win the B race. With that there were only a few events left; the 5000m (Matthew Derbyshire and Joseph D took on the 12 and a half laps to take 4th in the A and second in the B), the women’s Javelin (Becki took on yet another new event to come second in the A, accompanied by Anne who took second in the B), and finally it was just the relays to come. Even on tired legs, the Wallsend/Blyth ladies were only narrowly beaten in the 4x100m, but more than made up for it by comfortably winning the 4x400m. The men’s 4x100m was hotly contested, and won by an impressive Durham team, but our team ran well to come 3rd, with plenty of room for improvement, and maybe even a team record. This was followed by an exhausting 4x400m, in which a flying run from Daniel brought the team home in second place on the final leg. When all was said and done, the combined Wallsend/Blyth team came out comfortably on top, giving us 6 league points and leaving us top of our division. But we can only stay there with as many people as possible volunteering for events to make up the points, so let’s keep bringing such a strong team out, and we might just be in division 2E next year. Denver “the Bronco” Stretesky gets a big ‘W’ in the SGP opener. In conditions fitting a winter grand prix, no one would think this was a summer grand prix night. That didn’t stop 33 Wallsend Harriers to take on the course around the Rising Sun country park. And it was the Rookie, Denver, crossing the End Zone first, extending his lead throughout and storming home with a strong 4th quarter finish. It turned out to be an excellent night for the Stretesky’s, Paul finishing in 7th and Mason taking 3rd place. Kya Morton, improving with each race, held on to 2nd. Fastest times on the night came from our usual suspects, Harry Coates with a 10:19. Nick Zissley, 10:55 and Matt Darbyshire holding off Simon Lyon with a 10:57. Becki Newman was our first lady on 13:19, with Lyndsey Thompson 2nd on 13:25 and Gill Weatherill with a 13:42. Well done all. We also had a new record on the night, David Scoins securing a new O60 records with a fantastic 13:13. Congratulations David. Great thanks to Jackie Garnett, Kayleigh Dunn, Kenny Chambers, Mick Bell, Mark Summers, Kev Payne, Elaine Liu and Sarah Cawthorn, for helping with officiating and marshalling. Our next race on the calendar will be the Clive Cookson 10km on Wednesday 20th May, club entry will be arranged, keep an eye on our notice board. And don’t forgot we have the Gordon Smith’s Relay around Segedunum on Wednesday 13th May. More than 300 runners paid a fitting tribute to the inspirational former Wallsend Harrier Chairman Terry O’Gara at his third memorial run on Sunday (April 26th). 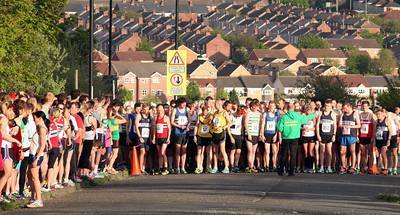 Held at Segedunum, Wallsend, along the Hadrian’s Way Cycle Path, 240 senior runners took on the 5k challenge. 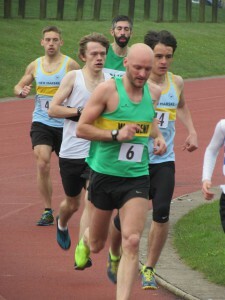 Leeds City (but Newcastle-based) athlete Carl Smith fought off a strong cohort of Morpeth Harriers to win in a time of 15:16. Bill McGuirk has done a cracking race report which you can read in full on the Chronicle website here. Our very own Green and Golds turned out in force, with Phil Aiston the first Wallsend Harrier home in a time of 17:20. 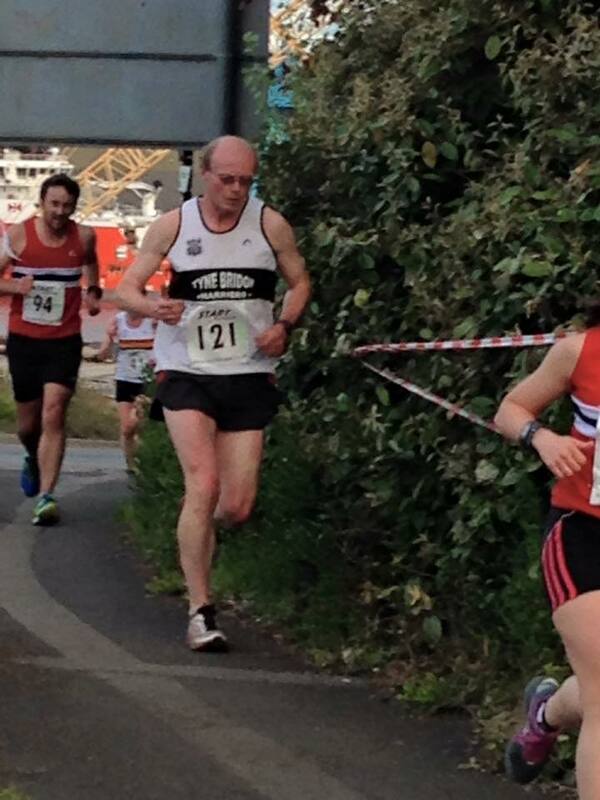 And no surprise to see Brian Hetherington taking first Wallsend vet in 17:52! Great running by Bex Lambson, who was our first lady across the line in 19:41. The Green and Gold juniors dominated the fun run, which had almost 100 entries! Great running by all but particular mention to Thomas Rumney (1st), Matt Summers (2nd), Sam Charlton (3rd) and Ellen Williams (4th). It was fantastic to see some tiny tots giving it their all too – the next generation of Harrier champions no doubt! To see some great photos from the day, visit our photo gallery. If you have any pics you would like to add to our Flickr page please do message me for our account details so you can upload them. A massive thank-you to all those who organised, marshalled, sorted race numbers on the day. And a special thank-you to Terry’s son Steve and his family for starting the races and giving your support as always. It was such an emotional day and I know Terry would be so proud.